Gosshhh… Had been crying since 2009 summer, the unusually spread of chikunguniya in VNR, everyone just saw it as a political spat. It’s the same mosquito that spreads chikunguniya that spreads dengue !!! 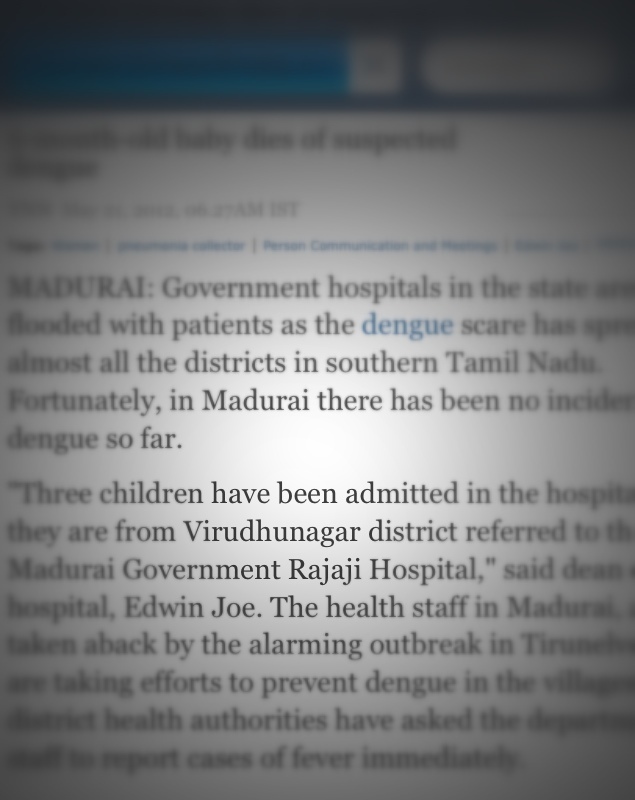 Chikunguniya has high morbidity but DENGUE has high mortality among all ages. Dengue just goes off like every other fever in the first attack but the second exposure there comes the dengue shock & hemorrhagic fever which are lethal if recognized late. So we are just seeing a tip of a iceberg. Dengue/Chick carrying mosquito breeds only in fresh water. Storing water happens throughout the year in our place then why there is sudden spurt ?? The road conditions in our VNR is filled with rain water after these summer showers – the ideal place for these Mosquitos !!! It’s time now people have a personal reason to fight for a public cause before they loose their dear ones. Hope we get roads to lead a health life. Please do report to the municipality if anyone tests positive for dengue with lab reports.